Why breakfast smoothie? On workday, in the morning, we don’t always have time to make our breakfasts. Stopover at Tim Horton’s or Starbucks results in parting with some hard earned money; but, more importantly, it results in breaking the diet. Because you either don’t know what’s inside that muffin, or don’t want to know ( for an obvious reason). You know what’s inside that smoothie and stick to the diet. This breakfast smoothie can be used as a legitimate pre- or post-workout meal. All its ingredients are DASH-approved. If you follow the flavor of DASH diet by Marla Heller, widely advertised by Dr. Oz, and you are on the first stage of the diet, this smoothie doesn’t fit its requirements. 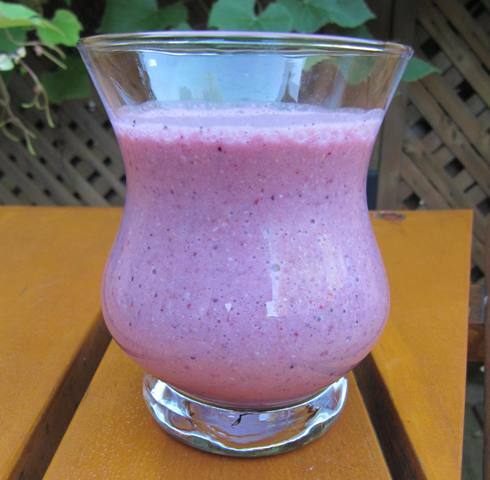 But if you are follow the original DASH diet ( or the second phase of the above version), this smoothie fits your diet. Original smoothie calls for coconut water. Coconut water has its benefits – it contains electrolytes and trace elements that your body needs when working out. However, it is already naturally sweet, and some brands contain added sugar. If you use dairy instead, or almond milk, you will be more in line with the DASH diet. Place ingredients in your blender, first frozen ones, then oats, then liquids. Smoothie can store for a day, so you can use it for your breakfast tomorrow. So be careful – if you are on 1200 calorie DASH diet, 1/2 of this smoothie will provide all fruit for the day and 1/2 the sugar you can eat. In this article, I want to discuss not only why brown rice is so important, but also how to start cooking it so that you can enjoy it. Because only then eating brown rice can become an automatic choice rather than tough dietary decision. And so protection of your health will become automatic. Won’t it be nice? The DASH diet doesn’t restrict your rice choices. So let me ask you, when on the DASH diet, do you choose brown rice or white rice? 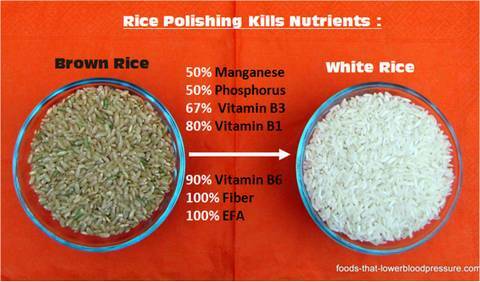 If you opt for white rice or no rice at all, you are not alone. Many people have difficulty making brown rice a permanent part of their diet. Even though researchers assert that brown rice provides the whole array of health benefits. Yes, besides lowering blood pressure, brown rice is essential in anti-cancer diet. While attending one of the natural health events, I met Denny Waxman, the leading educator of the macrobiotic lifestyle in the US. I met his clients, who are now free of cancer. I listened to their stories. These people won their fight with cancer using macrobiotic diet. They ate brown rice at least once a day. Denny repeatedly stressed the importance of two grains for the optimal health: brown rice and millet. Why brown rice, not white? DASH diet doesn’t restrict what kind of rice you should choose – but if you want your DASH plan to work faster, I recommend that you start choosing brown rice over white. 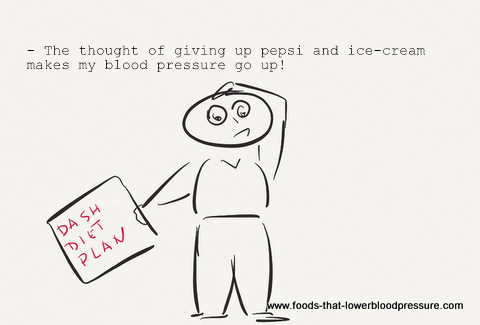 It’s only a smart thing to do as you can lose more weight and lower blood pressure faster. So why many people don’t eat brown rice? Old habits die hard, and that’s exactly why many people cannot switch to brown rice. It doesn’t feel the same, it is not as tasty, complaints just go on. Eating rice is natural for the Asian cultures, but not as much for the Western diet. When we traveled China, our traditional breakfast was congee – boiled rice stew with fermented veggies and peanuts. Everyone eats it at least once a day there. While in North America, you can go for weeks without eating any rice, unless you order a takeout from an Oriental restaurant. So people might not know how to best use brown rice and they are not accustomed to cooking it. Just like white rice, brown rice comes in the same varieties, because “brown” means “hulled but not stripped of bran layers.” For example, brown basmati rice is chewier than white, and has the same aroma. There are brown short-grains, you can cook them so that they either stick or fall apart, they are reminiscent of Arborio rice that is used for Italian rizottos. And there are purple, red, black rice varieties – relatively new and more expensive. You might like basmati but not brown basmari rice. That’s why it is important to try a few types and see which one works for you. It seems, every Asian household has a rice cooker. Rice cooker steams rice, preserving the most nutrients and keeping its nice texture. However, you don’t have to buy a rice cooker.And you don’t have to work hard and spend much time on looking after your rice while it cooks. Step 3. Once rice boils, mix it well, reduce heat to a minimum, cover rice with the lid, and let it cook for 40 minutes. Once it absorbs water, try it – if you feel it is undercooked, add a little bit of water and cook for another 10 minutes. I cook rice in 20 minutes. I soak it in water overnight, and use the sequence above, just adding water in the proportion 1:1 as opposed to usual 1:2. Brown rice is great in soups, salads, stews, rizotto. It can be used in stuffings, and some people even make brown rice milk out of it. You can freeze some of it and use later. You are welcome to explore brown rice dishes on this site. Even a half a cup brown rice a day can make a difference. 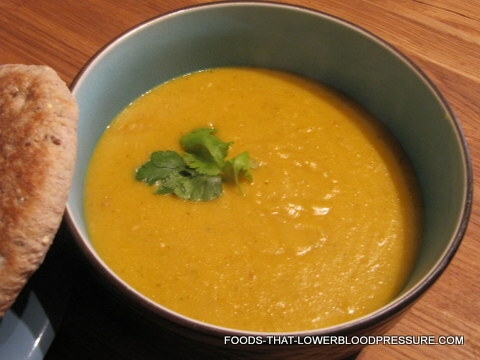 This lentil soup recipe is a high blood pressure sufferer’s dream. It contains THAT much of blood pressure lowering ingredients. Actually, it contains so much garlic that I would think it was created by an Ukrainian ( never saw anyone loving as much garlic as we do!) It has a healthy amount of ginger, very little oil, and overall is a very healthy soup. Whether you are on the 1200, 1500, or 1600 calorie DASH diet, every calorie counts. This recipe for coconut milk rice with spinach is ridiculously easy, quick to make (if the rice is prepared in advance) and very tasty. It contains lots of fiber, Potassium, Magnesium and other vitamins and minerals needed to lower your blood pressure. 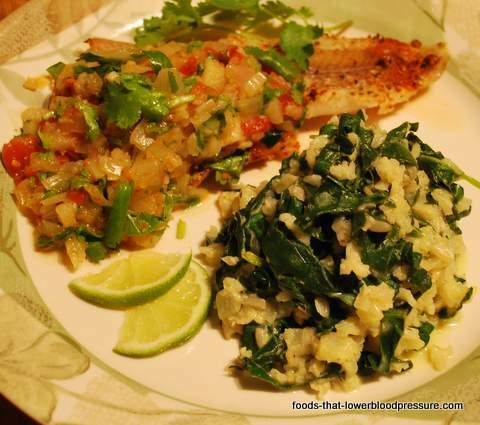 I served it with tilapia under pineapple salsa; the whole meal was delicious and very well put together. A while ago I posted about the benefits of hibiscus tea for lowering blood pressure. Some readers were asking where to buy hibiscus tea to add to their DASH diet plan. It is available at health foods stores, Whole Foods, and other high-end supermarkets. But it is quite expensive for some people to shop there; not to mention, there are no customer reviews to help you choose. I will show you other ways to buy hibiscus tea at a reasonable price. We, Russians and Ukrainians, are CRAZY about garlic. We put it everywhere… Well, maybe, not in cinnamon buns, but definitely in every main dish, side dish and appetizer. Garlic is a big part of our folk medicine. So big, that during the flu season it seems like the whole country stinks of garlic. 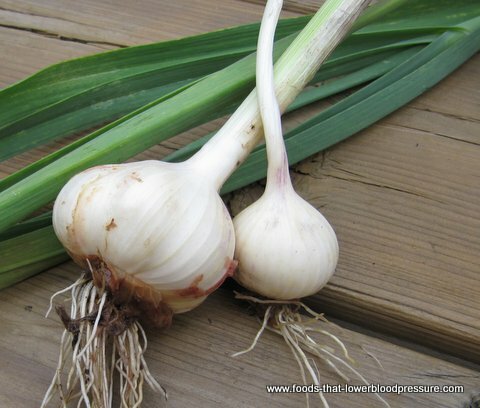 People make their own mixtures with garlic, use it in cooking extensively, or just leave cut garlic cloves on the premises so that its potent smell kills germs. And here is a reason why you might want to be crazy about garlic too – this is one of the herbs that is proven to lower blood pressure. How can you possibly live on just one teaspoon of sugar per day? Most people put more than that in just one cup of coffee! Any soft drink contains more sugar than that. How are you going to cope with THIS requirement of your 1200 or 1500 calorie DASH diet? Thinking of reducing sugar on the DASH diet? 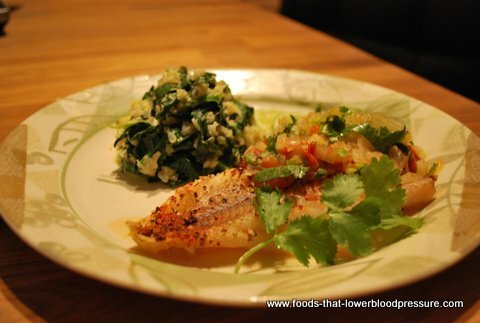 Whether you are on 1200, 1600 or 2000 calorie DASH diet, you are allowed to eat fish, so today I am going to show you a low calorie low fat recipe which consists of foods that lower blood pressure. For the low calorie DASH diet, non fatty fish is a great choice, especially if you love fish. If you are eating it only because of the recent hype about need to eat fish for its omega-3 content, I will show you better ways. 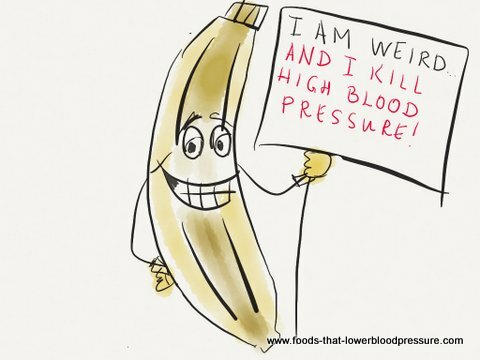 Are you looking for that one weird food that kills high blood pressure? Multiple articles and newsletters come out with sensational headlines like this, claiming that this time some researcher has found that silver bullet, the solution to the blood pressure problem. What is it this time? We’ve tried banana, celery, sea salt, beets, pomegranates, ginger, hawthorn…. What’s next? This recipe combines two blood pressure lowering foods, ginger and sesame oil, with rice that provides fiber to your DASH menu. Sesame oil is available in Thai and Chinese supermarkets in plain and spicy variety. I use both. Having come from the country where spicy foods are not usually consumed ( except we can eat enormous amounts of garlic! ), I add spice with caution.